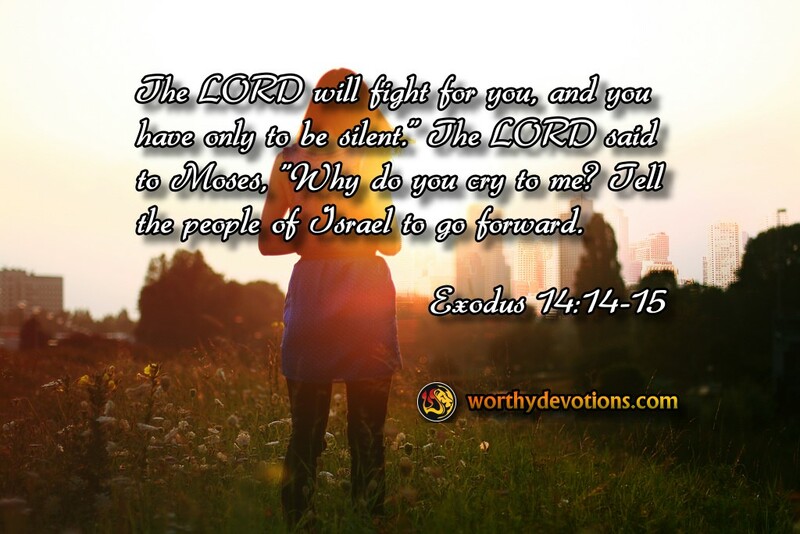 Exodus 14:14-15 The LORD will fight for you, and you have only to be silent." The LORD said to Moses, "Why do you cry to me? Tell the people of Israel to go forward. The Lord spoke to Moses, who led the children of Israel out of Egypt to be desperately cornered with the Red sea before them and Pharaoh's chariots advancing upon them from behind. Overwhelmed with terror they cry out to Moses, "It would have been better for us to serve the Egyptians than to die in the desert!" Having just miraculously escaped from the miserable life of slavery, and only beginning their new life of freedom, the children of Israel were faced with the most dire threat to their existence. This test of their faith, to trust God for their very survival, followed only a few days after the young nation's astounding deliverance. Could it really be that YHVH had brought them out just to have them recaptured and returned to the slave camps or be slaughtered by Pharaoh's army and be food for vultures? We, who have been delivered from a life of slavery from sin, may also quickly be faced with massive and overwhelming trials, and we may cry out desperately to God, "Is this what you delivered me for !!??" How is it that the enemy, having lost his hold on us, will often make furious attempts to reclaim or even destroy us? Yet he is relentless, especially when he has just suffered a crushing defeat. Now the Lord said to Moses, "Why do you cry to me? Tell the people of Israel to go forward." No, you were not delivered to be ensnared, recaptured or slaughtered by the evil one. His final threat will only prove to be his undoing. Go forward, press on! Your trial, your obstacle, the threat against you, is proof of your deliverance, and may just turn into devastating defeat for the one who is set against you. What Israel faced at the Red Sea, what appeared to be their death sentence, suddenly and irrevocably became God's instrument to crush their enemies. "Tell the people of Israel to go forward!' Just do it. The Lord will provide your victory!